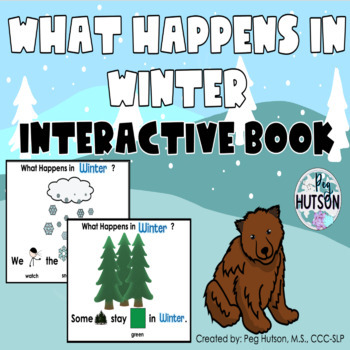 An Interactive Book: What Happens in Winter Time? If you liked WHAT HAPPENS IN FALL? then you will want WHAT HAPPENS IN WINTER TIME? This is another adapted book for older students. 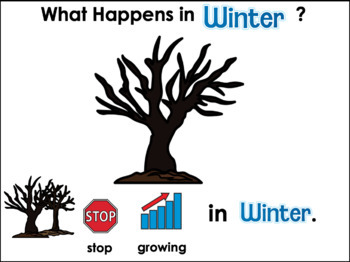 WHAT HAPPENS IN WINTER TIME? 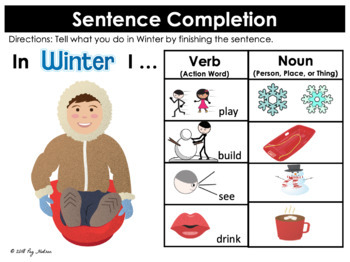 focuses on the changes that occur from fall to winter. This adapted book is for readers and nonreaders alike. The predictive sentences and picture cues facilitate students’ comprehension and sentence formulation when retelling. The content will appeal to upper elementary and middle school students. There are 29 pages in the story including 2 activity pages. All of the picture images are also provided. 6. What we do changes in the winter time. Each page includes space for 1-4 images to be placed. Playful images demonstrate each concept. 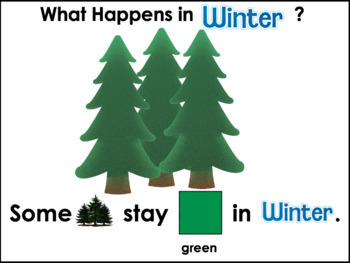 -Students can use WHAT HAPPENS IN WINTER TIME? during independent, individual, small-group or large-group time. The story could even be sent home for additional practice. -Great for students with speech and language delays and disorders. The visual representation of the story helps with sentence formulation and story retelling.